I practically live in my rag & bone duds because they are über comfortable and fit my lifestyle at the beach to a tee; however, I never really thought about how this American fashion label made it into my closet until I started watching the realty television series, The Fashion Fund, on the Ovation channel. In 2006, Marcus Wainwright and David Nevelle, the designers behind rag & bone, were only finalists in the Council of Fashion Designers of America's (CFDA) Vogue Fashion Fund; however, the exposure from “The Fund” boosted the brands popularity. And rag & bone is not alone: Designers such as Proenza Schouler, Doo.ri, Rodarte, Phillip Lim, Alexander Wang, Thom Browne and Public School (just to name a few) have become household names thanks to the endowment that helps to support the next generation of American fashion designers. Thank God for Netflix because I first became aware of the CFDA/Vogue Fashion Fund in the 2005 documentary Seamless. I was riveted as Fashion photographer Douglas Keeve followed three hopeful finalists of The Fund in their journey through the competition, which was created in response to the effects that the Sept. 11, 2001 attacks in New York City had on the American fashion industry. 9/11 happened during Fall/Winter Fashion Week of 2001 and, a lot of fledgling American designers – who had invested everything in their presentations that year – lost it all when the shows were cancelled. So it seems that Wintour and her Selection Committee of fashion luminaries have become guardian angels to these 10 designers who compete over a four month period to prove that one designer has what it takes to be named Fashion Fund Designer of the Year. 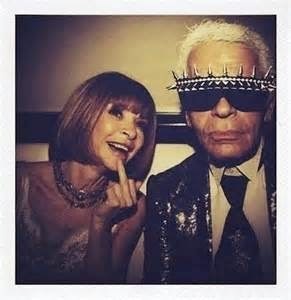 Like its documentary movie counter-part, The Fashion Fund television show continues to profile and document all 10 designers who get to work with the Wintour and her team of fashion gurus, who include: iconic fashion designer Diane Von Furstenberg; Jenna Lyons, Creative Director and President of J. Crew; Ken Downing, Sr. VP of Niemen Marcus; Mark Holgate, Fashion News Director of Vogue; Andrew Rosen, Founder and CEO of Theory; designer Reed Krakoff; and Steven Kolb, CEO of CFDA. The eligibility requirements for the Fashion Fund aren’t for the feint of heart or novice as the CFDA requires a designer of discernible talent- i.e. have garnered substantial and recent editorial coverage, and have support (orders) from top retailers; The primary design business based in the United States has to have a minimum of two years in business; and boast a professional staff, paid or volunteer, which can devote the time and effort required to accomplish the stated aims of an applicant’s design career plans. The reason the requirements are so strict is that the award comes with $300,000 monetary award and a one-year mentorship with some of the biggest names in fashion which makes the television series so fun to watch. First of all, it has been enlightening to watch the Grand Dame of Fashion interact with the mere mortals on the show. Wintour really does seem like a scary human being but the show certainly reveals, at times, a more human side to her. The committee on the whole is a pack of bull dogs but – since they are propelling these young designers’ careers – they are brutally honest and expect full-disclosure; nothing is off limits and they hold these designers accountable to the highest echelon. The Fashion Fund show documents the various stages of the competition. Right out of the gate, the show does not disappoint. In one phase, the Selection Committee visits the design studios and meets with each of the 10 finalists. I love the interaction between the designers and fashions greats during these one-on-one visits. In this most recent season, Designer Tanya Taylor starts off on the wrong foot with the Queen of Vogue. After realizing that Taylor moved her showroom since the application process, Wintour and Lyons end up hoofing it all over Manhattan to find Taylor’s new location. The cameras are following them as they use Lyon’s iPhone GPS to try and figure out where they are going and it seems to be in circles at one point. Wintour arrives at Taylor’s new studio in a huff and spats at the young designer that alerting The Fund of an address change is designer 101. Taylor is completely caught off guard but, in my opinion, handles the wrath of Wintour as well as can be expected. When the bubbly, young designer shows Wintour a rack of laser cut leather garments, she lets Taylor know the garments “look cheap;” However, Lyons swoops in to save the day. She is calm, cool and collective and counters the biting remark by offering advice on how Taylor can make the laser cutting look better. So, what makes the show so heavenly is that, despite the angel wings, it is possible to see a little bit of that alleged Wintour devil peak through and color the show red.